The butter fat fraction market report illustrates data for 2018 (estimated) to 2028 (the forecast year), in terms of sales revenue in US$. The report comprises various forecast factors that impact the growth of the butter fat fraction market. Market dynamics such as opportunities, drivers, trends, and restraints have also been included in the butter fat fraction market report. The drivers impacting the butter fat fraction market include the Increasing number of working women, increasing demand for infant nutrition products, thus, for butter fat fraction There are certain restraints covered in the report, Adulteration of ingredients, Lack of comparable clinical studies, and high cost of production with low output yields. Butter fat fraction as an ingredient in functional food and beverages, and Focusing on tie-ups with specialty ingredient manufacturers and biotechnology companies are expected to create opportunities in the butter fat fraction market. There are major trends governing the butter fat fraction are significant investment on research and development to imitate the nutritional profile of infant formula similar to breast milk, Switching infant formula brands, and rise in premium infant formula nutrition products. We have also included an outlook for the global food and beverage industry, major trends influencing the food and beverage industry, global trends in the food and beverage sector, an overview of the food additives industry, an overview of the pharmaceutical industry, an outlook of the personal care and cosmetics industry, and the perceived health benefits of butter fat fraction when included in food products. The report also comprises a strategic overview, followed by a value chain analysis and key information of the prominent players operating in the global butter fat fraction market, along with a detailed competitive analysis. This information will give a thorough overview of the butter fat fraction market to the readers. The butter fat fraction market report also includes a market attractiveness analysis by source, form, end use, and region/country, along with absolute $ opportunity and incremental $ opportunity. There is a year-on-year growth trend covered in the report for every sub-segment. The report also includes market structure, and a detailed comparison between multinational players and regional players in the butter fat fraction market. 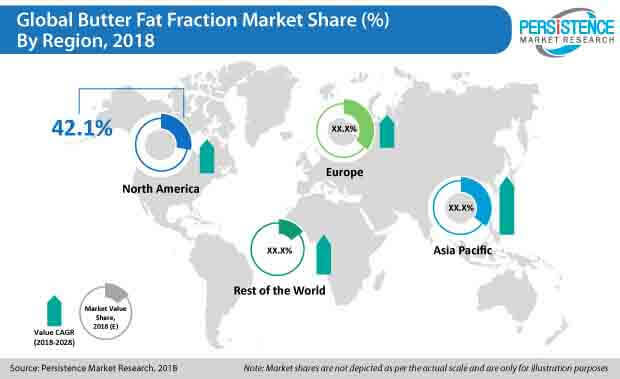 During the study of the butter fat fraction market, our analysts observed that, butter fat fraction is largely preferred by manufacturers of food products such as bakery, dairy, confectionery, convenience food, and other such products. The report states that, butter fat fraction finds large-scale application in the food and beverage industry, due to the increase in the demand for texturizers, and increase in the preference for Japanese-flavored food products in various countries. Butter fat fraction is expected to have increasing application in the pharmaceutical and personal care industries in the coming year, due to various health benefits. The report also consists of the company profiles of prominent butter fat fraction manufacturers, and the revenue generated by these companies across world – North America, Europe, Asia Pacific, and Rest of World. To evaluate the revenue of butter fat fraction manufacturers, the average price of butter fat fraction was obtained from various suppliers, manufacturers, distributors, and exporters through quotes. Key application segments of butter fat fraction were considered, and the dynamic ones were projected on the basis of feedback from different secondary sources and primary respondents. Data points were collected and considered for the modelling approach, which includes the overview of the food industry, overview of the beverage industry, overview of the hydrocolloid industry, outlook of the pharmaceutical industry, overview of the animal feed industry, and the average purchase price of butter fat fraction. Assuming that currency rates remain constant during the forecast period, the butter fat fraction market value were estimated. The butter fat fraction market report also includes additional information such as opportunity pockets for the manufacturers of butter fat fraction, global economic outlook, perceived health benefits of butter fat fraction, key regulations in various regions, major trends in the food and beverage industry, an outlook of the food additives industry, forecast factors, and recent developments in the butter fat fraction market. Various secondary and primary sources were consulted during the course of the study. Secondary sources include annual reports of major companies, recent publications, Factiva, and Hoovers. The report also includes a detailed pricing analysis on the basis of product type for every region, and the trade scenario of butter fat fraction. The trade scenario includes the data of top exporters and importers in the butter fat fraction market. The report includes a detailed and descriptive competition dashboard, which gives an overview of the companies that have been profiled. The regional presence of companies, revenue, product offerings, headquarters of companies, and the intensity of product types, ranging from high to low, are points that are mentioned in the competition dashboard. A comprehensive competition analysis of the major companies in the butter fat fraction market has also been provided in the report. This will help readers evaluate long-term and short-term strategies, various product offerings, and recent developments in the butter fat fraction marketplace. Some of the key players (manufacturers of butter fact fractions & industrial fat fraction/ end users) included in the market report are Corman SA, The Tatua Co-operative, Arla Foods Ingredients Group P/S, Land O'Lakes, Inc., Murray Goulburn Co-Operative Co. Limited, Nestlé S.A., Groupe Lactalis S.A., Royal VIV Buisman, Dairy Crest Group plc, Koninklijke Friesland Campina N.V., Fonterra Co-operative Group Limited, Mead Johnson Nutrition, Glanbia Public Limited Company, Agropur Ingredients, LLC, among the other butter fat fraction manufacturers and end users. Butter fat fraction is stearin and olein milk fat fraction with different melting points and SFI’s (solid fat index). This butter fat faction is obtained from a physical process. These butter fat fractions are of two different types such as industrial fat fraction, and value added fraction. The process used to obtain butter fat fraction is the slow cooling of melted fat. A short stabilization time is required during the fractionation temperature. The crystals are then separated by vacuum filtration using a perforated disc which is made up of stainless steel from the liquid oil. This is the way to obtain butter fat fraction. The fractionation temperatures used to obtain butter fact fraction are 29, 26, 23 and 19°C for winter butter fat fraction. For summer butter fat fraction 29°C and 19°C are used. According to the United Nations Department of Economic and Social Affairs, in 2017, the total world population stood at 7.6 billion, and is estimated to increase by approximately one billion by 2030, and reach 9.8 billion by 2050. This constantly growing population is expected to increase the demand for infant nutrition products. The demand for infant formula is significantly high in China as well as in certain countries in Asia Pacific, owing to the high infant population coupled with increasing urbanization. Moreover, the increasing population with high birth rates is one of the major factors boosting the demand for infant nutrition products in the developing countries of Asia Pacific. Infant mortality rate has also reduced considerably in these regions during the past few years. For instance, the birth rate in India stood at 19.3 births/1,000 population in 2016, which is relatively higher as compared to developed countries such as the U.S., U.K., etc. In addition, the infant mortality rate per 1,000 live births has also decreased in developing countries. In 2013, the infant mortality rate in India stood at 40.0 as compared to 42.0 in 2011. The increasing population and high birth rate is expected to have a favorable impact on the infant nutrition market in developing countries. The functional food and beverage segment offers ample growth opportunities for butter fat fraction, owing to the rising awareness among consumers related to the consumption of such products, as they offer a plethora of associated health benefits such as neuronal and cognitive development, healthy gut, supports healthy microbiota, etc. Currently, due to low production yield and high pricing, almost all butter fat fraction ends up as an ingredient in infant formula and medical nutrition. However, through R&D, manufacturers can scale up the production, lower the operational costs, and cater to the surging demand from the functional food and beverage segment. Key players can focus on collaborating with specialty ingredient manufacturers for a win-win situation, as specialty ingredient manufacturers can share their expertise and knowledge, such as clinical studies, patents, etc., on the ingredient, while key players can provide resources such as capital for scaling-up production, establishing distribution channel, logistics, marketing, work force, etc., for large-scale production. For instance, AAK AB, a Swedish-based company which produces specialty vegetable oils and fats, collaborated with Enzymotec, which is an Israeli-based specialty chemical manufacturer, to develop bio-active lipid ingredients, by creating a new company - Advanced Lipids. The newly created company utilizes the Enzymotec expertise on lipid technologies and AAK’s international strength in food safety, production, and logistics. There has been a meteoric rise in the number of premium infant formula brands in developed as well as developing countries. Rising disposable income and purchasing power of parents, in turn, is boosting the demand and adoption of premium infant formula products across the globe. Rising health consciousness and zeal to provide the best available products to their children among consumers is changing their buying behavior. Consumers are now opting for the best high-quality infant formulas, which is further strengthening the growth of the market for premium nutrition products. Moreover, most premium infant formula products offer a specialty ingredient to stand out of the crowd and justify their higher pricing. For instance, Abbott Laboratories offers HMO in its Similac PRO-ADVANCE series, while Mead Johnson offers MFGM (Milk Fat Globule Membrane) in its infant formula. The increasing urban population coupled with changes in consumer lifestyles is also fueling the demand for premium infant formula products, especially in case of elite customers, thus increasing the demand for specialty ingredients. Major key players in the premium infant formula market are Mead Johnson, Nestlé, and Abbott Laboratories, whose premium products include Enfamil PREMIUM Infant, NAN Starter Infant Formula, and Similac PRO - Advance Infant Formula, respectively.